Most of us have heard some variation of the old axiom “Don’t worry about strategy, it’s all in the execution”. I often say myself that I prefer an average strategy and great execution to the opposite. But the reality is that in most cases in a tech business you need to do a pretty good job at both to be successful. There are exceptions, of course. A hot brand or very large company may be able to get away with either an uninspiring strategy or clumsy execution on occasion. But even at large software or hardware companies, if that happens too often results are bound to suffer. At startups and small companies even one instance of bad strategy or poor execution can be the death knell for the company. While it usually does–and should–start with strategy, in most cases it’s best not to be too “Blue Sky” in your approach. Or maybe you start off allowing blue sky ideas, just to make sure that the innovation juices are allowed to flow so you won’t miss promising strategies. But I’d recommend that at some point in your strategy process you include an explicit step or filter by asking: “This is this a promising strategy – but is this realistic?” And what’s the definition of realistic? 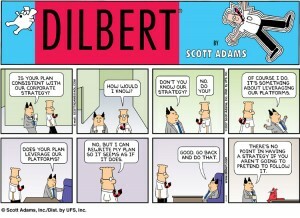 A strategy that can be EXECUTED by YOUR company. Not by some undefined company, not by a huge company with unlimited reach and resource, but by YOUR company. That’s the essence of a realistic strategy. One of the critical things that must be considered early on is the fit between the company’s capabilities and the target market requirements. 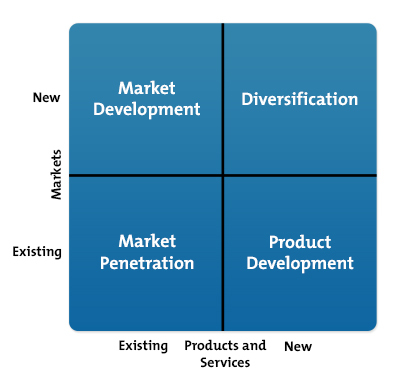 Because of this, it’s almost always less risky to stay within the 3 “closest” quadrants to your current business using the common Ansoff matrix as the strategy construct. That fourth, riskier quadrant is the one at the upper right. This “diversification” quadrant is where you’re heading toward a new market segment with a new product or technology. This is where the greatest execution risk lies, because you may not have the right technology or marketing skills to serve this new target segment. While it’s not impossible to have success with this “riskier” strategy, it becomes all the more important to take a careful inventory of the company’s capabilities and map that against the requirements of the new target segment. Is your organizational structure properly set up? For example, if you have a highly centralized or matrixed organization, but are trying to implement a strategy that relies on data collection and fast decisions which can only occur lower in the organization – you’re likely doomed to fail. Do you have the right skills/competence? If the organization is heavy on technology expertise but light on marketing skills or cost-competitiveness, it’s going to be tough to compete in a mature market segment where margins are thin, if your entering with little product differentiation. Better to pick a earlier stage or smaller tech market segment in this case, or wait to enter this segment when you can create a large technological advantage. Are your incentives appropriate? Say your sales force’s compensation is primarily based upon volume and existing products are relatively easy to sell. In this case the sales folks are heavily incentivized to “mine” existing accounts and sell the current products. Yet you’re pursuing a new strategy that bets the company on penetrating a completely new customer base, with a new product that has a long sales cycle. In this situation you’re way out of alignment on the sales side with the new strategy–and likely screwed. Do you have buy-in throughout the organization? It doesn’t matter how elegant the strategy or how well you’ve matched your capabilities with market requirements. If the folks who are going to implement the strategy aren’t on-board — you’re almost certainly headed for failure. Don’t formulate strategy and throw it over the wall, no matter how good it is. You need to involve the people who will have to implement it and get their input, at the earliest possible stage. In the real world it’s better to have an average strategy that everyone is dedicated to implementing, over a great one that the rank & file ends up sabotaging. Do you have an execution mentality? I’ve seen many “strategy-oriented” technology organizations and executives fail at their chosen strategy because of an organizational imbalance between strategy and execution. Because the strategic component is where their interest lies, not enough effort and resources is expended on the execution piece of the equation. 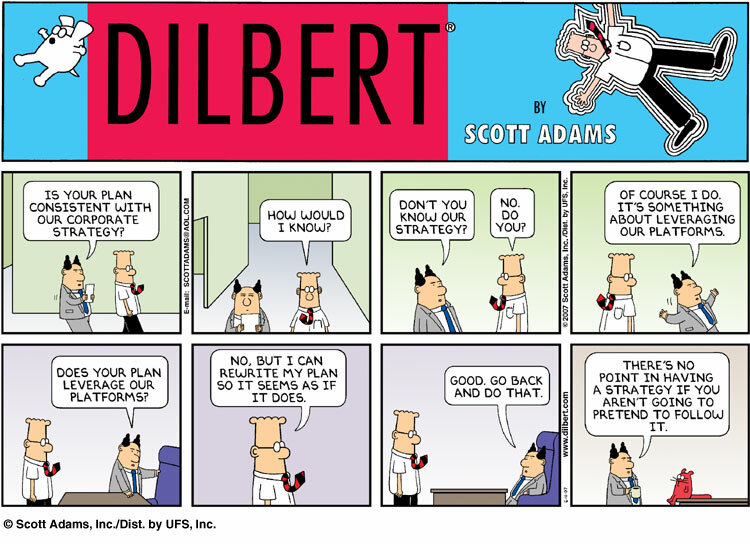 This mentality often leads to prematurely discarding a strategy and moving onto the next one. But execution is rarely perfect at the outside of any new strategy. The best executing companies are patient and systematic at improving their execution, giving the strategy every opportunity to succeed before throwing in the towel and changing course. It is obvious that both strategy and execution are very important to achieve success in most circumstances and always important to maximize that success. In the end, the most important thing in a software or hardware company is to make sure that your organization is not imbalanced toward one of these key components or the other. That means doing your best to stay balanced in your thinking, but also bringing in folks that are stronger at execution to balance a strategy-oriented team. Or vice versa, if your company is better at execution than strategy. This will not only balance the discussion in the room when key decisions are being made, but will also give you the best chance of both formulating the best strategy and executing it optimally. The message in the previous paragraph may also seem obvious. However, I find that executives have a strong tendency to “hire in their own image”, which greatly increases the chances of an “imbalanced” team. It’s important to guard against this in your hiring. That’s my take on balancing strategy and execution in the technology business. What’s your view? Chime into the discussion with you own comments below.